At Midtown Toyota, we know the car-buying process can be tedious, and we are here to make it a bit easier. We have a variety of new Toyota cars, from sedans like the 2019 Toyota Corolla to minivans. If you are looking for a mid-size car, check out the 2019 Toyota Highlander. Available at your Chicago, IL, Toyota dealership, this bold SUV provides comfort and room to spare for both passengers and cargo. The 2019 Toyota Highlander is up for anything, whether you need to go on everyday errands or a road trip. 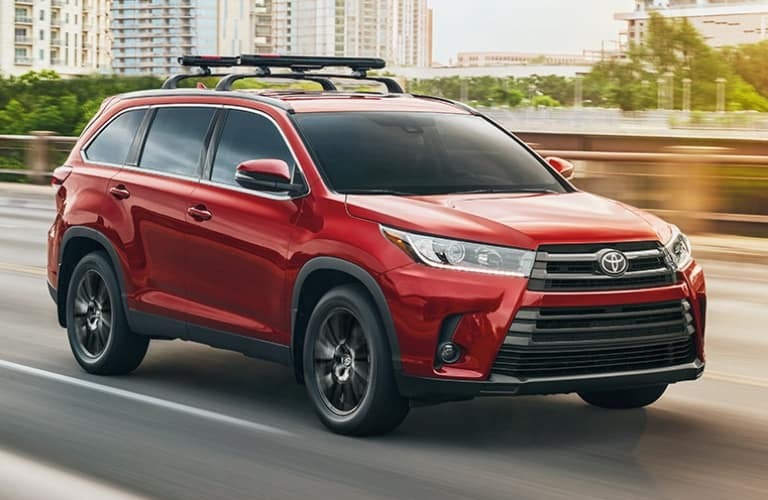 There are six different trim levels available starting with the base Toyota Highlander LE, which comes with a 2.7-liter, four-cylinder engine that is capable of producing 185 horsepower along with 184 lb.-ft. of torque. This SUV also has three rows of seats that can seat up to eight passengers. The third row can even recline for some added relaxation. The rear suspension also utilizes every inch of space to create more room to fit all your gear — expanding to 83.7 cubic feet of cargo space when the second- and third-row seats are folded down. Safety is a top priority in the 2019 Toyota Highlander. All trims come with Toyota Safety Sense, which bundles advanced driver aids like an alert to when your car moves out of its lane and automatic high beams. Other aids, like blind-spot detection, are included on trims above Toyota Highlander LE trim. Your Toyota dealer near Oak Park can discuss all the safety aids in further detail. A special feature that comes included with the 2019 Toyota Highlander is a 6.1-inch touchscreen system. Avoid shouting in the car with Driver Easy Speak, an optional high-tech feature that transmits your voice to rear-seat passengers. You can also add a Bird’s-Eye View Camera that assists you in seeing nearby objects and getting out of small spaces, a must in the Chicago area. Take entertainment to the next level with the available rear-seat Blu-rayÔ system. To see this amazing SUV in action, visit your local Toyota dealers near Evanston. The hardworking staff at Midtown Toyota will sit down with you and discuss your needs to find a vehicle that works with your life, whether it is the 2019 Toyota Highlander or any of the other available on our lot. We hope you stop by your Chicagoland Toyota dealership soon.